The DJI Phantom 4 drone series has ushered in a new era of liberated film-making, with individuals being able to get out there and – with very minimal equipment – bring home incredible images captured from above. However, as drones are extremely precious pieces of equipment, you need to ensure that yours remains protected on your adventures. Backpack cases are a popular choice, as they offer supreme portability, and are lightweight enough that you can literally take your drone anywhere with you. We’ve vetted five popular options so you don’t make the wrong pick. 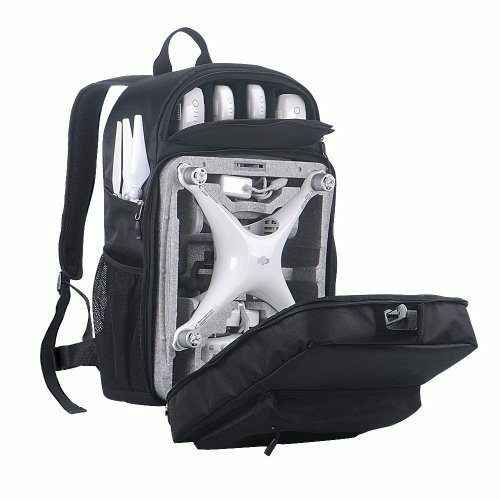 The Koozam DJI Phantom 4 drone backpack is a great all-around choice for those looking for a highly portable way of transporting their Phantom 4 safely. The backpack sports many features that seem custom-built for taking your drone on unique adventures. Not only is the pack built for all weather types, including a water-resistant finish in case it needs to be carried in the rain, but the main zipper opens on the side that rests against your back. This ‘anti-theft’ measure ensures that no one can unzip the bag and remove contents while you are wearing it – a great piece of practical design that will allow you to travel confidently with your drone. Its lightweight (3lbs) design means it won’t put too much strain on your back while hiking or biking, and it fits perfectly into an airline overhead cabin for maximum ease when traveling. 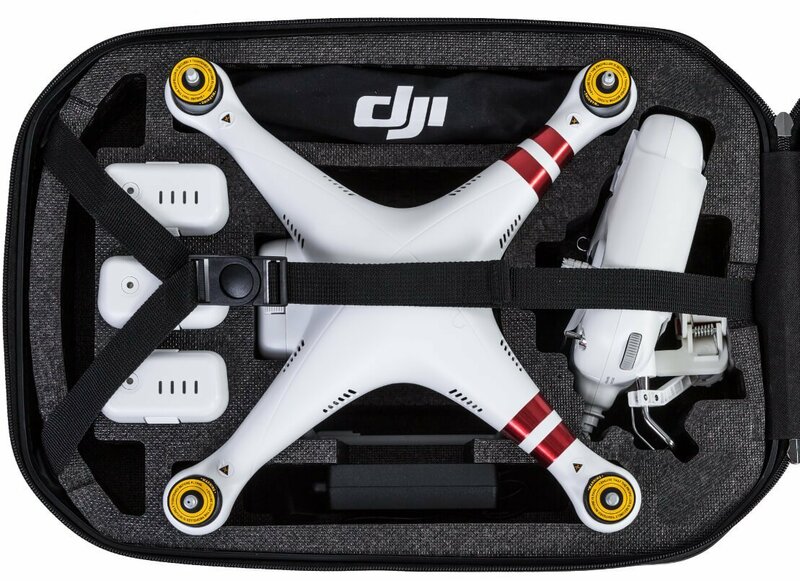 The inside of the backpack is fitted with lightweight, high-density foam which is shaped to hold a DJI Phantom 4 drone, two spare batteries, a charger, a remote and a tablet. This is a generous amount of space, easily able to house enough equipment for a weekend trip. These items fit snugly in the backpack and will not jostle around even during strenuous activity. A highly appreciated feature of the Koozam Phantom 4 backpack is the ability to store the drone with the prop guard attached – this will help keep these important pieces of equipment safe during your travels. 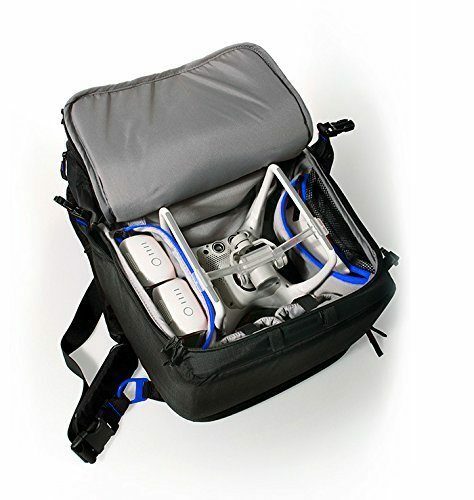 With comfortable shoulder straps and a side water bottle holder, the Koozam DJI Phantom 4 backpack is perfect for those who wish to take their drone with them everywhere they go. At the top end of the scale, the water-resistant Lykus DJI Phantom 4 backpack is a great choice for those who are looking for a backpack to give them long-term outdoor use. A little heavier than the Koozam option at over 4 lbs, the Lykus Phantom 4 backpack is made from a high-quality 1680D Nylon water resistant material and features layers of additional padding to keep the drone and its accessories safe while on the move. However, despite this slight bulkiness, the backpack has thick, soft pads in the straps, as well as in the back and waist regions. This reduces pressure, a really useful feature for lengthy hikes (or long waits in airports or train stations) when carrying equipment on your back can become exhausting (if not downright painful). In terms of design, the Lykus Phantom 4 backpack consists of discrete, padded compartments: the bottom section holds the drone unit, as well as two separate battery pockets (holding 4 batteries) and a spare pocket for up to 4 propellers. The backpack also has a top section, with a detachable EVA holder and space to securely store the controller and charger, a side-pocket and a mesh inner pocket so it can easily accommodate tablets and extra memory cards, as well. 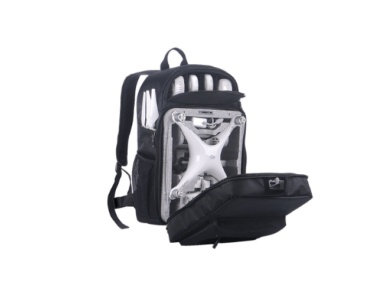 A great thing about this backpack is that, since it does not make use of the usual pre-cut foam interior, you can also use it to carry other similarly-sized drones, such as a Hubsan X4 Pro, Xiro Xplorer, and Ghost Drone. 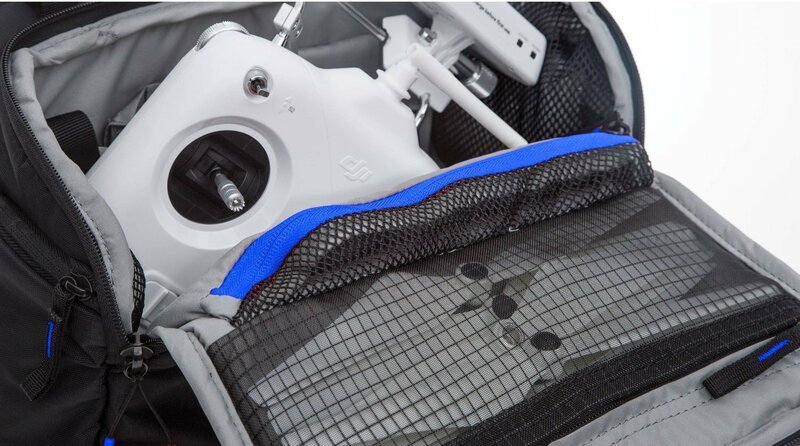 The Lykus DJI Phantom 4 backpack comes with a rain cover in case you get caught out in a storm and offers more than enough protection to guard against accidental bumps and knocks. An excellent choice for professionals who need a long-term outdoor transport solution. Smatree’s DJI Phantom 4 backpack features an ingenious way of transporting the drone unit safely: by making use of its original styrofoam case. The backpack’s large main compartment neatly houses the styrofoam case and features a rectangular hole so you can unlock the case and open the backpack all at once. A pocket on the other side of the main compartment has enough space to carry a tablet (up to 9.7”) or other mobile devices to sync up with your Phantom 4 remote. There are four more carry spaces: a compartment at the bottom of the bag that holds 4 extra batteries (or can be adjusted to fit different accessories), an upper back compartment that can also neatly house batteries or memory cards, a pocket on the side of the backpack for extra propellers, and a pocket for a water bottle. The Smatree SmaPac DP3000 Backpack is constructed from a high-quality, durable tear-resistant polyester material – but note that this backpack makes no promises about weatherproofing, so be careful about taking it out in extreme conditions. The backpack is compact in size and lightweight, featuring comfortable shoulder straps, and is perfectly suitable for lightweight personal use. One potential drawback is that the styrofoam case is not included with the Smatree SmaPac DP3000 Backpack – meaning that if users have already disposed of theirs, this might not be a viable option. The Powerextra Hardshell Traveling Backpack offers an appealing crossover option, falling somewhere between a backpack and a hard case. 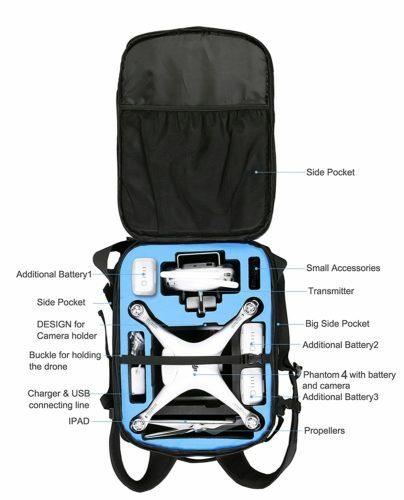 Although not as light as a pure backpack option, it offers better protection; while, although it is not as rugged as a hard case, it is far more portable (it fits into the overhead compartment of an airplane), and the ability to carry it on your back means you can conveniently transport your drone to the remotest of locations. The case is constructed with the impact-resistant hard shell case on the outside (to protect against falls or bumps) and a soft backing made of durable, breathable mesh to sit comfortably against your back. Thick shoulder straps are an appreciated asset, helping to offset the bulk of the hardshell case. The backpack is also waterproof, meaning it can be used in even the most extreme weather conditions, or in situations where it might need to be on location for extended periods of time. The interior of the backpack is made from strong high-density foam and features specially-cut compartments for the drone body, spare batteries and memory cards, two spare propellers, the charger and remote control. The components fit snugly into the compartments and will not shake or jostle during a hike or bike ride. The lack of space for a tablet might annoy some users, who will need to carry this piece of equipment separately. The Powerextra Hardshell Traveling Backpack is a professional-grade choice, perfect for users who are serious about outdoor or sports filming, and who require a rugged transportation option that can stand up to any test. The SSE DJI Phantom 4 Backpack is a decent budget choice for a lightweight, highly portable drone pack. Designed for medium-duty personal use, this backpack will be perfectly useful for keeping your equipment safe during a walk or short hike – but might not be ideal for strenuous activity or for use in very rough weather conditions. The backpack is constructed from tear resistant PVC material and is water resistant, however, so you don’t need to worry about being caught in the rain – and it includes a handy rain cover in the event of downpours. The pack features comfortable straps and can be worn as a shoulder bag or a backpack, complete with a side pocket for your water bottle. The protective foam is designed to withstand mild shock, and the interior features three spacious, customizable compartment separated by protective foam. All told, the backpack can carry a drone unit, up to five spare batteries, four spare propellers, the charger and remote control, as well as a range extender and even a 15” laptop. This additional space means that the individual components are not ‘locked’ in position in any way – so be careful when transporting your equipment on rough roads or on public transport. 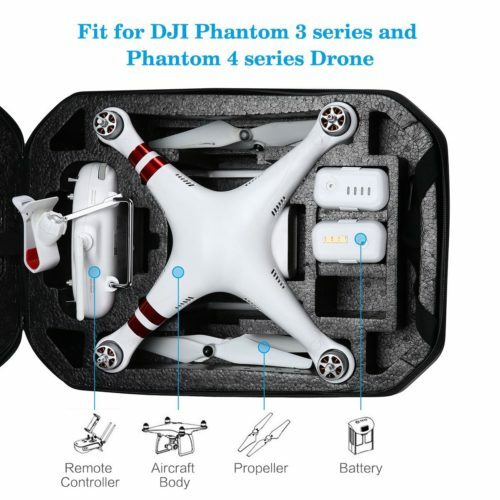 However, this roominess means that SSE DJI Phantom 4 Backpack can also accommodate other similarly-sized drones – a feature which might appeal to some buyers who require this versatility from their drone backpack. 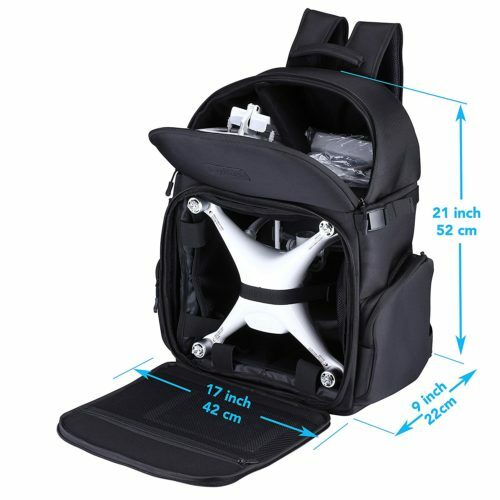 Overall, the SEE Phantom 4 backpack is a solid choice for beginners or for who those who already have a hard case and who are simply looking for a cost-effective way of transporting their drone on short outdoor trips.